SHARKBITE (AUS) (2003). 5 wins-2 at 2-from 1000m to 1700m, A$292,000, MRC Lord S., L. Sire of 151 rnrs, 77 wnrs, inc. SP Jester Halo, Siorca, Shayana and of Jaws of Steel, Andrassy, Clear the Beach, Viaductress, Galeocerdo, Izenashark, Lucky Flipper, Mako Magic, Penthouse Pet, Shockwave Miss, Pearly Whites, Sasenkile, Wired, Global Squire, King Shaka, Sharkpeace, Owl on the Prowl, Samikosho, Shark Mirage, Ballina Bay, Fabulous Flipper, etc. Andrassy (f. by Sharkbite). 6 wins. See below. Alonzah (f. by Zuberi). Winner at 1200m in 2017-18, MVRC Sweeney Estate Agents We Know West P.
Jawsome (g. by Sharkbite). Winner at 1200m in Aust. Pride of Ardrossan. 3 wins. See above. Keefwood. Winner at 1600m in Aust. Jamelden's Dream. Placed in Aust. Royal Sencherec (Stylish Century). 7 wins. See above. Royal Gems. Winner at 1550m, STC Leichardt H., 2d AJC Jim Donohoe H., Ted McMenamin H., STC Rhodes H., Darlington H. Producer. Signature Magix - Royal Dancer (Sing.). 5 wins to 1400m in Malaysia and Singapore, Singapore TC Class 5 H.-twice, 2d Singapore TC Class 5 H.-4 times, 3d Singapore TC Supersports S., Class 5 H.-twice. Buckland Boy - Spitfire (H.K.). 3 wins-2 at 2-at 1200m, Whangarei RC Cecconi 2YO Challenge S., HKJC Lei Yue Mun Park H., 2d HKJC Phoenix H., Bank Street H., Arctic Ocean H., Mong Kok H., Equidia Channel H., 3d HKJC Tai Lam Chung H., Audemars Piguet Lady Millenary H.
Weave. Winner at 1400m in NZ. Vienna Waltz. Winner at 1000m in NZ. Royal Eve. 2 wins. See above. REPUTED (Diagramatic). 11 wins-4 at 2-from 1200m to 2450m, A$268,337, VRC Moomba P., Gr.3, Ballarat Cup, L, 2d QTC Grand Prix S., Gr.2, MVRC Waterford Crystal Mile H., Gr.3, 3d Queensland Derby, Gr.1, VATC Easter Cup, Gr.3. HAVELOCK'S PRIDE (Gondolier). 8 wins-1 at 2-from 1100m to 1600m, A$185,450, VATC Autumn S., Gr.3, GCTC Goldmarket H., VATC John's Hope H., 2d VATC JJ Liston S., Gr.2. Sire. BASKERVILLE (Bassenthwaite). 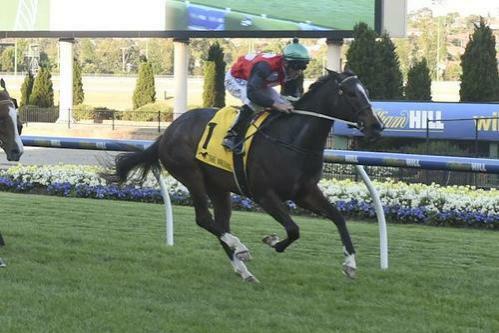 4 wins-2 at 2-from 1200m to 1600m, VRC Carbine Club S., L, 3d VATC Sandown Guineas, Gr.2. SPARKS (Thunder Gulch). 2 wins at 2, A$132,635, AJC Breeders' P., L, 3d VATC Blue Diamond Prelude (c&g), Gr.3. ZETOILE (Balmerino). 5 wins from 1300m to 2400m, A$184,395, Qld Tatt's RC Winter S., L, 2d GCTC Silk Stocking H., L. Producer. KAPISTON (Lake Coniston). Joint second on The 2000-2001 NZ 2YO Free H. 2 wins at 2, NZ$117,550, ARC Ellerslie Sires' Produce S., Gr.1, Fayette Park Stud Juvenile H., 3d Manawatu Sires' Produce S., Gr.1, Masterton RC Lowland S., Gr.3, ARC Mercedes Super Bonus Fillies Juvenile Prelude. Producer. PACIFIC DANCER (Groom Dancer). 5 wins from 1500m to 2400m, NZ$20,360, A$355,050, Geelong Cup, Gr.3, Clarence River JC Grafton Cup, Gr.3, 2d MRC Memsie S., Gr.2, WRC Anniversary H., L.
BLACK MAGIC (Longhorn). 5 wins to 1200m, A$176,600, BRC Juanmo S., L, Channel 7 Queensland H.
CHASE THE SUN (Pentire). 8 wins from 1400m to 2150m, NZ$140,650, A$72,522, Riverton Cup, L, CJC Spring Classic H., L.
6 wins to 1500m, A$188,240, MRC Debra Coombs H., Off the Track H., Guinot Skincare P., MVRC Westar Trucks Isuzu H., 2d Pakenham RC Evergreen Turf H., 4th MRC WW Cockram S., Gr.3. Served by Dream Ahead. Date of last service, 05.10.2017.